Seagate is launching two enterprise class hard disk drive (HDD) models optimised for storing data in the cloud. It claims that the 4TB Seagate Terascale HDD is the highest capacity model on the market available in a 3.5-inch SATA HDD form factor. Additionally, it's pitting the drive as its lowest cost per gigabyte enterprise HDD for use in scalable multi-drive systems. 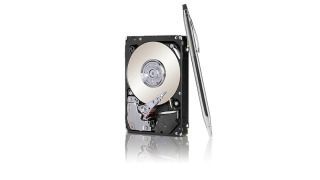 The HDD features 5900rpm spindle speed, 64MB DDR2 cache and Serial ATA-600 interface. It claims the typical power consumption of the drive is 6.49W, idle power consumption 4.59W and standby/sleep energy consumption 0.77W. Features bundled with the Terascale HDD include Seagate's Instant Secure Erase (ISE) technology, which cuts down drive erasure times from hours to milliseconds for drive disposal or repurposing, and a 6Gb/s SATA interface for easy integration with lower cost SATA infrastructures. Seagate has also unveiled the Seagate Enterprise Performance 10k HDD v7, which it claims offers high capacity storage suitable for mission critical servers while drawing low power. Loaded with up to 1.2TB of data storage, it's claimed to be engineered for high performance computing and high random and sequential workloads, including database transaction processing and high workload servers that process mission critical data. Seagate says that, with a 2.5-inch form factor, the 10k HDD v7 is also suitable for small scale data centres where real estate is at a premium. It also gets Seagate's ISE technology and RAID Rebuild functionality, which it claims makes RAID recovery faster and safer.